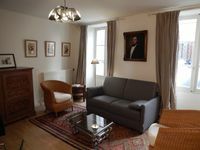 Properties in Avignon average 4.7 out of 5 stars. Property 36: The Atelier d'artiste. Property 48: Beautiful apartment in the heart of the Papal city. Property 49: 3 rooms air conditioning shaded garden close to the center of Avignon 4 pers. The property owner contacted us a few days before our arrival to say that our apartment was uninhabitable due to a water leak from an upstairs apartment. He offered us our money back or another apartment he owns. We took the latter and were delighted that we did. The apartment had everything we needed and its front door opened onto Place des Palais with the palace right opposite. Could not have been better located.